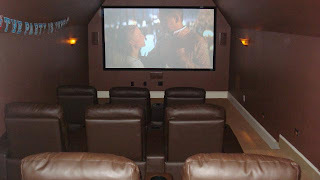 Everyone must be getting ready to hunker down for the winter because we have seen a rush on theater seats. Whats better that watching a movie when the weather gets cold? The only thing that makes that better is if you have your own personal theater! Interior Express and it's outlet store offer amazing prices and discounts on theater seats. The row of two shown above is priced at $500. 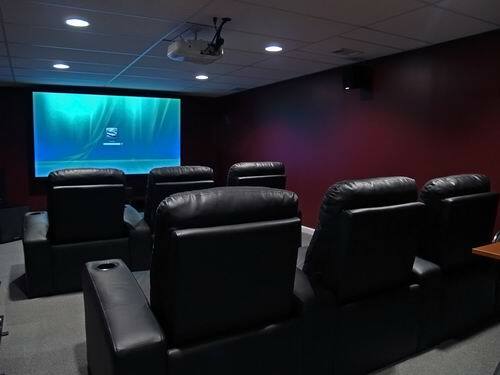 The black leather home theater seats have built in recliners and cup holders. 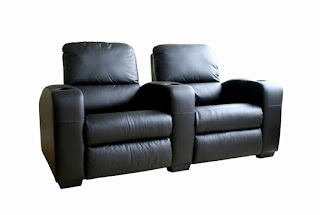 This is one of our most popular theater seat models and would look great in anyone's media room. They come in separated chairs and the backs are removable, making it easier to get through doorways/hallways. 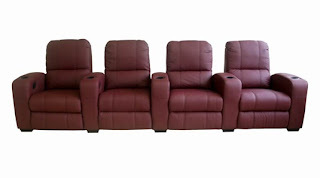 Right now on the show room floor we have a row of 4 burgundy theater seats for $699! The 4 pieces are from different dye lots and some of them have slight color difference, so we are offering them locally for a crazy discount!